So here’s a thing I’ve been struggling with. My personal photo filing system (see part 1 and part 2 of this mini-series) has worked brilliantly for years, except for one tiresome niggle. I number my photos sequentially and yes, I can do that straight away with all my images straight from the camera. BUT there are bound to be some duplicates and duds that I don’t need, so I’m either faced with keeping them forever anyway, or removing them later and having gaps in my file numbers. So one answer would be for me to do an image cull before I do my batch renaming, but this takes time I often don’t have. Typically, it’s more important to get those images into my central catalog and start using and sharing them straight away, and any culling process will have to wait until I have more time. But actually, the most important thing is that each filename is logical and unique. So the other answer is for me to just get over it and accept that there may be gaps in the file numbers! When I’m testing a new camera, I’ll usually end up shooting RAW and JPEG files together, and often Adobe Bridge cannot recognise these new RAW files – updates usually follow some weeks after the initial camera launch. When this happens, Bridge doesn’t recognise that the JPEG and RAW files are part of a pair, and gives them different numbers. 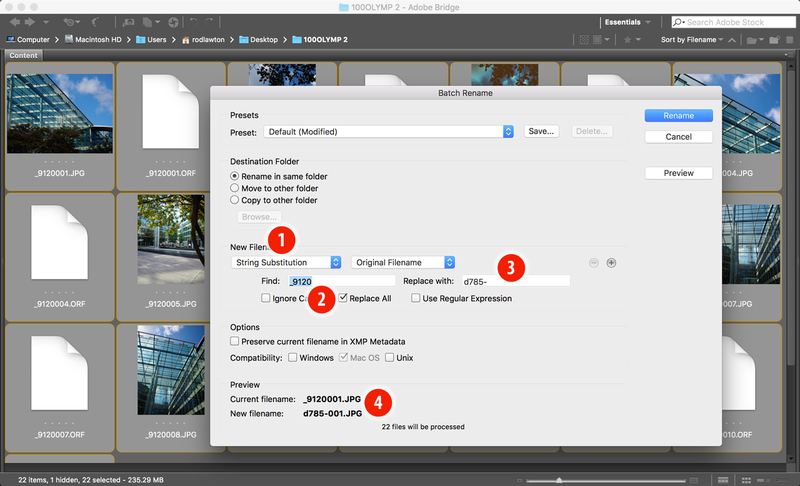 See ‘How to batch-rename RAW+JPEG pairs in Adobe Bridge’. Often, I want to experiment with effects and adjustments right away, without having to wait until I’ve done my batch renaming and image filing. The problem with that is that I end up with edited TIFFs and JPEGs based on the old camera filename, and if I batch renumber these in with the rest, they’ll get a different number to the original image, even though the image is the same. You can use Adobe Bridge’s Batch Rename dialog to assemble new filenames from different components, but until now, I’ve been using a static text string followed by an automatic index number. But the solution to both of my problems lies in one of the less obvious options in Adobe Bridge’s Batch Rename dialog, in fact it’s right down at the bottom of the menu – String Substitution. Basically, String Substitution (1) is like Find/Replace in a word processor. Now all digital camera filenames start with a fixed prefix, e.g. ‘DSC’, or ‘_912 in this case’ (2), followed by unique serial numbers. The trick is to find the static text/numbers at the start of the filename and replace this with the folder or ‘roll number’ from my own indexing system (3) (see part 1 of this mini-series), but still preserving the unique file numbers towards the end of the filename. 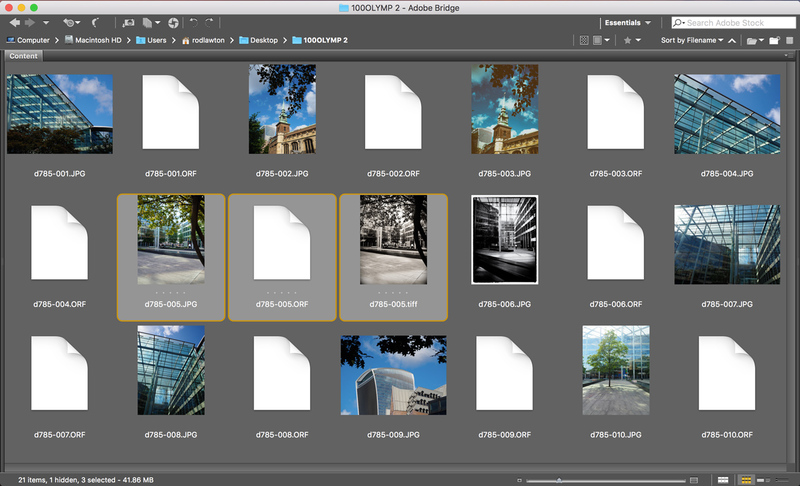 Usefully, Adobe Bridge shows a preview (4) of the old and new file names. This works because even though Adobe Bridge can’t make sense of new RAW file formats the camera obviously can, and will number them accordingly. So I can simply use the camera’s numbering as the second part of my new filenames. So here, because I’m still using the camera’s original file numbering and just substituting my own text string at the start, I can rename unrecognised RAW files and edited TIFFs while keeping the orginal file number. In other words, variants of a single image keep the same filename. And if I do create some new, edited versions of images before I carry out the renaming that’s fine, because the camera filenames I’m working on already have the sequential numbering I’m going to use later. For a minute I really liked this and thought it would be just the job for reorganising my photos – was thinking maybe nice to rename the last 8 years with immediately recognisable names to show which camera was used instead of out of the box manufacturer’s numbering which I lazily used so that I could start shooting without reading the manuals ! …. but in my 1st test I missed the .xmp and .on1 sidecar files until realising that in Bridge it was necessary in View to click Show Hidden Files which takes care of Lightroom and PS CC and ON1 RAW plus .dop for DxO Optics Pro and .exr for Photomatix and so on. But then I remembered Capture One and the whole thing becomes very tedious because I’ve not yet mastered and settled between Sessions-v-Catalogs and the folder structure for Capture One just has too many places … Cache – Proxies – Thumbnails – Selects – Output ….. the list goes on and on. I think it is just too difficult to belatedly reorganise those filenames and I will just live with what exists but change my in camera names now for all future photos. Just think it will be more fun taking new photos than renaming old ones! Still like the article though and may use it for a few straight forward photographic events in the past if not my entire 20 years of digital photos. Thanks, Zed – some good points there. I forgot about the .xmp files so I’ll take another look and see if I can work that into the walkthrough. I wouldn’t bother trying to rename your files going back through your archives because it will mess up your existing catalogs. Perhaps it’s worth thinking about going forward, though? Oooops Sorry for my typo should be Hi Rod slip of the brain not fingers! I no longer have that filing problem. About 3 years ago I had all my photos filed, some in several file folders, so that I could find any that I wanted quickly. There were close to 8,000 pictures. They represented years of work by me, an amature. Then at their request I allowed Apple to update my new Apple Mac Yosemite $3,500 computer. By the next day my file system was demolished. Apple sent its “geniuses” (on the internet, Never in person. ), to fix it. After tries by 6 different dullards including a woman who declared she was an executive she posted a sign “CASE CLOSED”. So in a manner of speaking I was, as far as Apple cared, non existent. It took me several years to find almost all my pictures but the neat files were no more. That is how it stands to this day. But Apple is still raking in the cash. They will probably cause this letter to vanish.